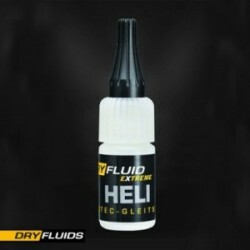 The very young German company DryFluids provides a revolutionary new lubrication technology for RC helicopter. While conventional lubricants are mostly based on oil or grease, DryFluid Extreme takes an entirely new approach buy using ceramic lubricant particles and micro-sized polymers that remain dry while ensuring full lubrication. A special adhesive component ensures that the lubricating particles stick to the surface that they are intended to lubricate. 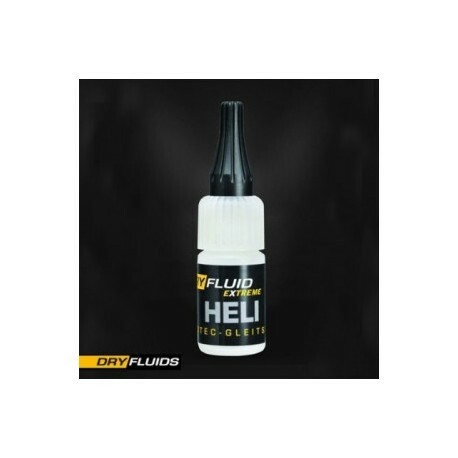 A fourth key ingredient is the fast evaporating liquid carrier that also ensures an almost unbelievable capillary action, allowing the lubrication particles to penetrate into even the smallest areas between gears and surfaces. The liquid carrier is formulated to dry within minutes of being applied, giving this revolutionary new product its name: DryFluid. The “Extreme” suffix indicates the environments this product is designed for. It can be used under extreme pressure, remain thermally stable at high temperatures while still delivering incomparable low friction for long term lubrication and dry run protection. Dry run protection is a special property of the new technology offered by DryFluid Extreme. Tiny ceramic particles act as a low-friction bearing between surfaces to protect them from wear. In addition, lubricating polymers reduce friction to offer a long-term protective effect.